If you care about your vehicle as much as you care about your bikes you ideally want to keep both safe and scratch-free during transportation. An effective method of doing so is with a spare tire bike rack, which is mounted onto the spare tire of your vehicle. Now obviously this only works if you have a vehicle where the spare tire is fastened to the rear door, which is common for SUVs and other off-road vehicles. If your spare tire is stored in a spare tire well or a spare tire cradle underneath the vehicle, you will have to look at other solutions. Fortunately, most folks that like heading out into the wilds with their mountain bikes prefer off-road vehicles to get there. So, if you do happen to have a spare tire attached to the back of your vehicle, check out our best spare tire bike racks. First, on our list, we have the Allen Sports Deluxe 2-Bike Rack. The rack has 15-inch arms that can carry two bicycles of up to 70 pounds. This structure is designed to carry your bicycles high to ensure that they are far from the road and away from the hot exhaust. Its metal frame feature and its double patented resolute straps provide a unique durability on your car. Patented design on its upper feet aids secure installation on the majority of aft mounted spare tires. The patented designs carry the bicycles up, from the road which makes it quite alluring. Its narrowly set carry arms aids easy bicycles loading, it has the ability to rotate, and this makes it suitable for various styles and sizes of bike frames. It allows you to quickly install bikes of various sizes and styles such as the adult, women and children’s bikes with absolute ease. The deluxe 2-bike from Allen sports comes with individual tie-down cradles. This individual tie-down cradle fixes on the carrying arm and helps to further secure and protect your bicycles when you are on the road. The rack model is quite sturdy; it is made of high-quality materials that ensure its durability. The Allen Sports Deluxe 2 spare tire mounted bike rack is also very versatile as it can fit on almost all externally mounted spare tires. The rack is amazingly light in weight, and at that, you can easily get it on and off your vehicle without putting much stress on yourself. Modifying your car to install this rack model is not needed since it can easily fit into cars due to the way it is designed. With the Allen Sports Deluxe 2 bike rack, worries on your bikes fell off can be laid to rest, all you need to do is to fix the bottom strap tightly and firmly. In case you are worried about paint scuffs, taping the two tubes of the bike frame and the frame close to the bottom bracket with a self-adhesive silicone tape will solve the problem with this model of the spare bike rack. Another cool feature of this bike rack is the fact that the extra wide bottom foot supports do not press down on the rim, but rather on the actual tire which can ensure that no damage will be done to your rim. This feature also provides reliable support for your bicycles. Conclusively, Allen Sports Deluxe Spare bike track can be installed easily. It requires little assembling and fits into numerous rear mounted spare tire sizes. It safeguards bikes, posses rugged powder coated finish that can withstand the wrath of harsh weather conditions. It comes with a guaranteed Allen’s lifetime warranty which makes us love the model. We are sure you will find this model as appealing as we do and probably start ordering for it now. If you want a bike rack that is destined to serve you for a longer period, the Yakima spare tire bike rack is for you. It features high-quality materials which makes it sturdy and durable. With its sturdy 60-inch locking cable, 35lbs weight, 32.5’’ carton length, 14.5’’carton width and 9.25’’carton height this bike rack can hold two bicycles at a time. 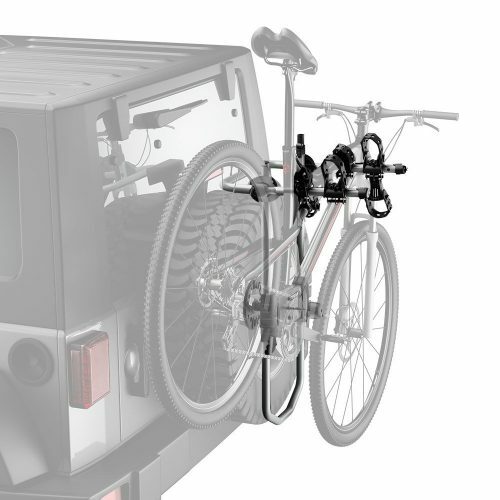 The rack was designed to attach directly to your spare tire’s mounting bolts to ensure that the structure is secure and that your bicycles are safe when you go on the road. The Yakima spare tire bike rack can fit into lots of car models, and you also have the advantage of checking Fit My Car on their website to search for your car compatibility with this model. The rack has SuperCush ZipStrip™ cradles that secure the bikes and also allow you to load and unload the bicycles in a breeze. Thanks to the anti-sway cradles, your bikes will be kept secure without any risk of moving, wobbling or making contact with your car or one another while you are driving – even on the more unstable terrain. The rack of Yakima spare tire bike is designed to fold down when you are not using it, so it automatically minimizes metal objects protraction on your car. This model also comes with TireTread™ pads that add to its stability and protection. It is very simple and easy to install the rack on your vehicle. So far the mounting plate is installed behind your tire, you do not need tools to fix in your rack, you can even decide to fix the rack anytime you want to. The rack can effortlessly carry two bikes without causing harm or damage to your car, and the bikes in as much as the bike or bike’s type are compatible with the rack. In case you have a five or six stud pattern spare tire mounts, and you are probably concerned about this model compatibility with the pattern; it’s high time you forgot your concerns. The Yakima spare tire bike is suitable for this pattern. As for security, this spare tire bike rack is SKS-lockable. You will also get two integrated bottle openers as part of the rack which is great for those days when you are driving your bikes out in the middle of nowhere and want to stop for a cold drink by yourself or with friends and family. Having a universal mounting plate with extensions that fit most lug partners is also an advantageous feature of the Yakima spare tire bike. Remove spare tire: with the help of a lug wrench, remove your spare tire and separate the lug nuts from the spare tire. Install the mounting plate: make sure the mounting plate positions on your spare tire holder. Be conscious of the fact that different vehicles require different mounting plate orientation. Take note of the numbers on the mounting plate as it will help you to know the mounting plate that would be most suitable for your car. If you have a tire support on your spare tire mount, pull down the bottom adapter plate to remove the mounting plate. Certain wheel offsets may demand using a different length tongue different from the ones stated above. If this is the case, try to tighten the spare tire. If it cannot be tightened using a shorter tongue, but you can spot the tick mark located on the tongue, you can then switch to using a longer tongue. Install your spare tire: Position your spare time on the protruding mounting bracket tongue after this, check the fit. Make sure the edge of the spare time overlaps the tick mark on the tongue if it does not overlap the tick mark use a longer tongue. Total contact should be with the mast and the spare tire. Raising support arms: You have to loosen the upper knob, raise the arms up into position and tighten the knob. Finally, load the heaviest bike first, match the seat tube to the stabilizing cradle and pull the rubber straps over the tubes at all three points (be sure the straps are completely engaged). It is safe if you lock your bike to safeguard it. This bike rack is a very popular choice among spare tire bike racks, and it is easy to see why. This Hollywood rack, is, first of all, a very simple and uncomplicated bike rack that is already pre-assembled and extremely easy to adjust. So there will be no need to struggle with tons of tiny parts that nobody knows where they fit. 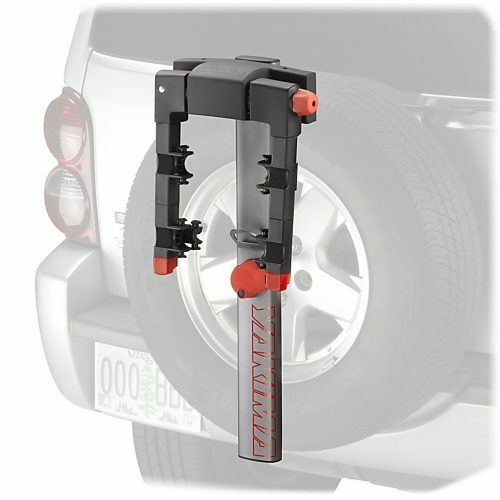 This spare tire bike rack attaches to your spare tire mounting bolts with a simple and convenient universal adapter plate. The rack comes with three extension brackets that are fully adjustable and designed to fit the majority of spare tires that are up to 12-inches bigger. The bike rack also features support arms that can be shifted over to the center for side mounted tires, and for the times when your bike rack is not in use. The arms can swing inward, and this makes it easy to fold the rack out of your way. This bike rack also places a lot of importance on the safety of your bicycles. Therefore, the cradles that are designed to carry two bicycles are covered in soft rubber and come with integrated safety straps to ensure that your bikes transport safely without getting damaged in the process. It also comes with a lock to secure the rack to your vehicle. The bike rack has dual pivoting arms that provide great bicycle support because it decreases the demand for adapter bars for women, children or alternative frame bicycles, but if you desire to purchase adapter bars, we would suggest a HRBA-PRO. It is also a rust resistance bike rack of sturdy steel construction with a black powder coat finish that can withstand both dry and wet weather conditions. 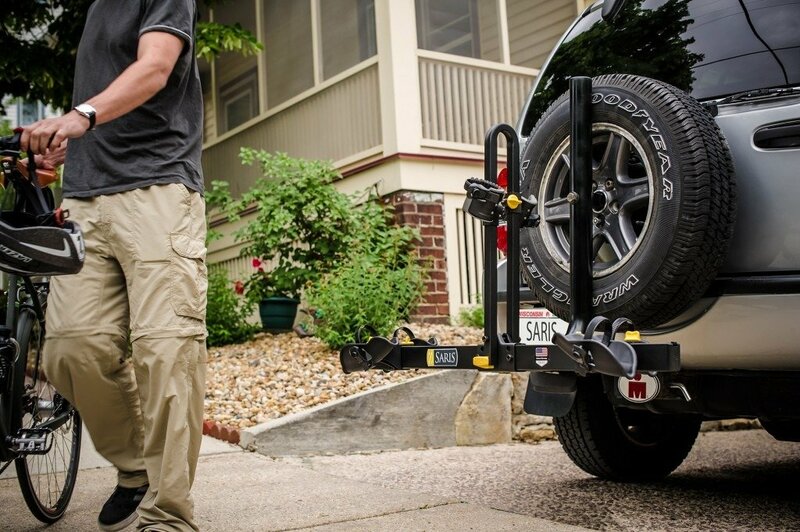 The Hollywood rack also comes with a mounting hardware cover plate that has a locking knob that prevents proposed thieves with the aim of removing the rack or the car’s spare tire from gaining access to the mounting bolts. It is recommended you buy a cable lock to prevent thieves from stealing your bike. You will have to remove the spare tire anytime you plan to install or remove the bike rack, and this is to your advantage because your bicycle cannot be stolen easily from your car. A customer that bought this product claimed he drove down a 10-mile rutted clay road and the bikes didn’t budge a bit and his claim is just a few of the praises the product got. Ensure you drive carefully on a bumpy and dirty road. To install this rack, you need to follow the guidelines below. Remove the tie downs that ties to the mainframe and the rear bar meant for the bikes. Position the rear bar around the spare tire (make sure the bolts are loosened for wide tires). Tighten the outside bolts with a 9/11’’ or adjustable wrench until the rack snugs on the tire. Ensure threading the two rear straps via the buckles located at the bottom of the main frame. Push the spring-loaded support arm up and rotate the arms outwardly (ensure it drops into the slot when it is in a locked position when in use and folded when not in use). Drive slowly while driving off roads. This spare tire bike rack is specially made to fit almost all spare tires that are externally mounted. It can hold up to 3 bicycles at a time and has been recognized among cycling enthusiast who desires a safe and secure way to transport their bikes. Their patented design is created to carry your bicycles high so that you wouldn’t have to worry about your bikes being anywhere near the road, shooting pebbles, or near the hot exhaust that could cause damage to your bikes. Its belt buckles work perfectly when tightening and losing the rack. This bike rack is very simple to set up, install and use. It has a well-assembled pattern, and it can install in seconds. It weighs only ten pounds, so you do not have to be physically strong or to be a professional weightlifter to go through the installation process and successfully install the rack. 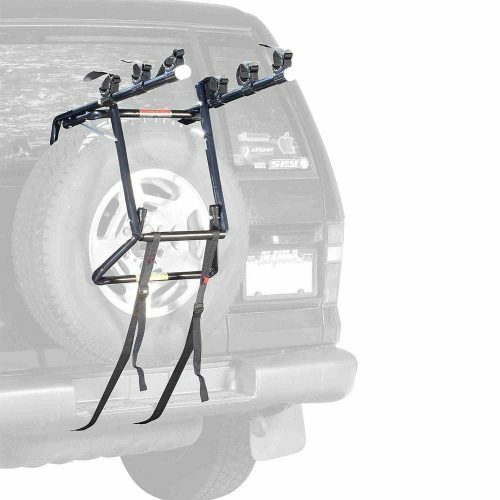 With the Allen Sports Deluxe 3-bike spare tire bike rack, your bikes will be individually secured to keep them from bumping into your vehicle or bumping into one another. The patented tie-down system secures and protects your bike individually. However, the rack should not be used on any travel trailer, 5th wheel or pull behind camper. The rack is well built; it has a narrow set carry arms that fit a wide range of bicycle sizes and styles with a rugged, high-quality components that guarantee years of dependable service. It is also a good thing to know that Allen lifetime warranty also backs the rack. From our survey, many of the customers who own the rack testified to its goodness. According to one of those customers, he used the rack on for a 2200 mile trip without a hitch and recommended the removal of the tire cover and the removal of the hooks from the straps (flip it over after removing it). He also advised putting a small foam pipe insulator or something similar on the bottom bar that crosses the spare rim, to keep it from scratching on the rim of your car if you intend using it with a 2007 RAV4. Another person that purchased this product suggests putting the rear wiper over the tire to prevent its obstruction of the wiper by the hook over the tire cover for 2009 Toyota RAV4 cars like his. Please follow the guide below. Set up your rack: Fold out the top-foot or the carry arm assembly. At the end of the wire struts, insert the pins into the holes on your top foot assembly and fold out the bottom – foot assembly. Mount the rack on your vehicle: Before you install the rack, remove any spare tire cover that may be damaged by the rack. Completely fasten the top hook or the carry arm assembly over the top of the spare tire, position your rack with your carry arm inclined a little bit upward and high to keep the tail light visible. Ensure the bottom foot assembly holds against the tire in a fully extended position. Open the rear door a little for easy attachment of hooks. Load your bikes on the rack: Load the first bike (the heaviest bike) with its chains and gear facing away from the rack (ensure the bike doesn’t come in contact with the car). If it is a woman’s bike, rotate the tie-down cradles so it can accommodate women’s bike style frame. Load subsequent bikes in alternating directions. Add padding where the bike point contacts. After the bikes are loaded, recheck to see that all straps are tightened firmly to the rack. Secure bikes to rack: All bikes should be fully secured to the rack. To ensure this, here are some of the things you need to do. Place bikes in tie-down cradles, thread the strap and pull tightly. 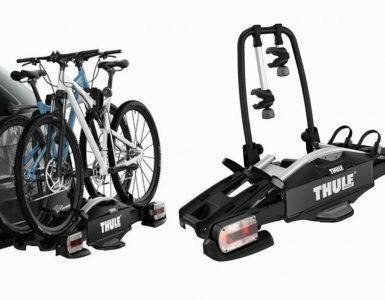 The Thule bike rack which attaches to your spare tire is designed to fit both regular tires and over-sized tires. You can secure up to 2 bikes on the Stay-Put Cradles with their anti-sway cages that will refrain your bikes from swaying back and forth and hitting your vehicle or one another thereby causing damages. 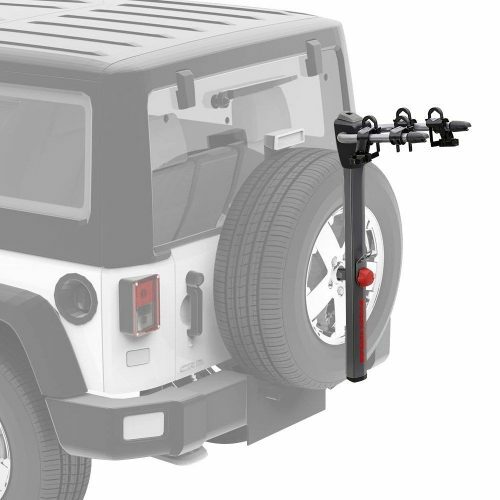 The spare tire bike rack comes with an integrated locking cable and locking knob that allows you to secure your bikes to the bike rack and secure the bike rack to your vehicle. When the rack is not in use, you can simply fold the arms down so that it will look neat and be out of your way. The rack is amazingly light in weight, and at this, you can install the rack in a breeze. Install the base plate: Remove the spare tire cover, lug nuts, and the spare tire, fit the mounting plate on your car (plate can fit into different bolt patterns. Install the spare tire over the plate and re-tighten the lug nuts. Use mount bracket and extensions: The tire width determines the combination of short or long mount bracket and standoff extensions. There must be a one-half inch of overlap at least when the square mounting bracket slid over the square post on your mounting plate. The Spare Me product comes with a short mounting bracket attached to it and this fit into most tires. Should you have a medium width tire range, use a long mounting bracket and a short standoff. If you have very large and deep tires, use the long mounting bracket and a long standoff. After this is done, ensure that you tighten the Spare Me to the tire with at least a half-inch overlap on the mounting bracket. In case your car doesn’t use a centered spare tire, you should remove the bolt with a hex key and the plastic with the trim piece. Move the square tube and secure it with bolts. Install your lock cylinder into your lock knob: Use your screwdriver to remove the plug from the locking knob and use change key to insert lock cylinder into the locking knob. Install your bike unit: Slide the bike unit onto the mounting plate tube, thread the knobby with a washer into the mounting plate and ensure it tightens firmly. Loosen the knobs, lift its arms up and tighten the knobs. Attach the safety strap if your tires are oversized: Are you using an oversized tire? If yes, wrap the blue strap with the metal buckle over the top and bottom tube of the spare tire rack. After that, strap down the back side of the tire closest to the vehicle firmly and vertically. Load the bike onto the arms: Load the heaviest bike first, start at the most inner cradles and alternate the direction of the bikes when loading the bikes. Tighten the bike frames securely with the straps and use the webbing strap to secure the bikes to the carrier. Inserting anti-sway: Insert your anti-sway cages into the bottom of your cradle by aligning the open end of ‘C slot and pushing the slot onto the bar on the bottom of the cradle. The surface of the cage that is smoothly curved should face outwards. The moment you insert the anti-sway, rotate the cage vertically and attach the cradle strap to the bike. Use the change key to insert lock cylinder into the end of the top locking cable and finally use the blue load strap with plastic buckle to secure both bikes to the frame of the rack and you are good to go! 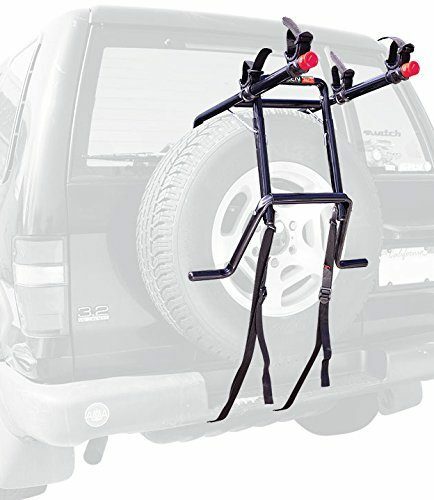 This Premier 3-bike spare tire rack from Allen Sports is unique in its way. It has a patented design, and it installs in a breeze on almost all spare tires. The rack is very safe and easy to use. It comes with a rugged feature which provides an added advantage if all you are looking for is a quality and durable spare bike rack. The product comes fully assembled and also backed by an Allen sports product warranty. The Allen premier 3- spare tire rack patented design quickly sets up and will safely carry your bike around town or across the country. This product of spare bike rack is equipped with a long carry arm (16”) that has a maximum capacity of 100 lbs. With this, the rack is destined to carry up to three bikes at a time with absolute ease. The product has a metal frame, and two pointed lower Sure Straps that provide the needed stability on your car. Its patented tie-down system separately safeguards your bikes. The tie-down includes very soft cradle bed to secure your bikes when your vehicle is on the road. The product comes with It also has UV resistant cradle straps that are long lasting to secure your bikes in place. This UV cradle strap fits with numerous ranges of tube sizes. And the good news is that you can easily fold the rack and get it out of your way or store the rack when you are not using it. Another advantage of this product is it a wide profile bottom foot that supports the weight of the rack and the weight of the bike on the tire. The creative way at which the rack design is, allows the rack to fit most oversized spare tires perfectly. The rack hooks over your spare tire patented designed to lift your bikes high to avoid touching the road and the hot exhaust. Since the product is made with high-quality materials and is specifically designed to fit almost all externally mounted spare tires, and scores a high mark on performance, it is one of the best bike racks I would recommend over and over again. Should you intend buying this product, note that the rack is not for trucks and long vehicles. Consult the manufacturer’s website to check for its compatibility with your vehicle before making your purchase. 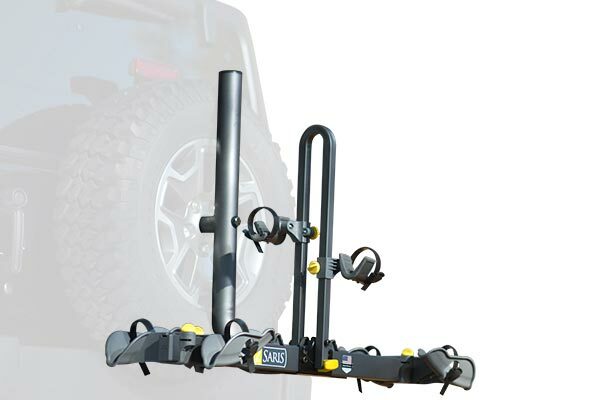 The Hollywood Rack is one of the best Spare tire mount racks to consider when it comes to selecting a bike rack with great performance and durability. Since it was introduced in the year 2015, the rack has gained the recognition of cycling enthusiasts who want a safe and secure way to transport their bikes. The Hollywood SRI Tire Rack 2 features a durable construction and soft rubber-like cradles that allows you to carry two bicycles conveniently with immediate alacrity. The rack can install over your vehicle’s spare tire securely, and the most interesting aspect is that it can be adjusted to fit almost all rear spare tires. The Hollywood SRI Tire Rack 2 comes with a rugged strap system that does not only help to install the rack in seconds, but also to remove the rack with ease when it is not in use. Apart from its simple clamping system, it comes fully assembled, and this further helps to reduce the time spent on installing the rack. For side–mounted tire, the rack’s support arm can be centered to allow for easy installation. The rack is light in weight (10 lbs) and also allow you to fold it flat when you have no use for the rack; this makes it easy to carry and store. Do not load more than two bikes on the rack. Try as much as you can to reduce your speed while driving on a bumpy and dirty road. Mounting the rack as we claimed earlier is easy, you only need an adjustable wrench with a 9/6” socket wrench. The rack comes with an easy and straightforward method to install the rack. The straps in the rack are made in such a way that is attached securely to the vehicle and tightened properly, depending on the type of vehicle you are using. With this rack, it is easy and faster to load and unload your bike. You can easily fit on your bike onto the carry arms and tie your bikes down with rubberized tie-downs that come with the bike. The track loading method suits lots of bike frames and sizes because the rack has support arms that can suit various bike frames and sizes. A crossbar adaptor on bikes is required if your bikes don’t have a horizontal top tube or your bike has a very big and uncommon shape. This track has a rubberized tie – downs that prevent your bike from going loose with road vibration. The product has vinyl straps, and buckles that you can’t find on most spare tire racks. The rack needs locking cables to secure the bikes to the rack because the product does not have a lock for the rack. Also, the rack needs an anti- swaying rubberized straps to prevent the bikes from bumping into each other. After considering its pros and cons, I can boldly conclude that this is one of the best racks to invest in. With its durability, ease of installation and the ability to secure and transport your bike, you would agree that this is one of the best bike racks for your money. Do you care to give your bikes a premium protection? If yes, the Yakima SpareRide Bike rack is for you. The space ride is made to attach to your car with ease. The rack is sturdy and very durable thanks to its high-quality steel construction. It is also one of the most stable and secure rear mounted bike racks ever produced. The rack comes with NEW SuperCush cradles that are destined to hold your bike firmly, giving your bike the best protection ever. It also comes with the NEW Tire Tread pads that provide extra stability and protects your bikes from falling off your vehicle while driving on rough trails. The rack is also equipped with a removable NEW ZipStrips, which allows you to secure your bike to the rack with ease. 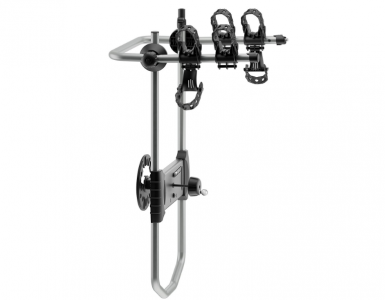 It simply holds your bike frames at three main points firmly to the rack. The rack has a dimension of L 40″ x W 13″ x H 19″ and weighs 21.5 pounds. Its ability to fit into nearly any stock size spare, including extra-large truck tires are a good factor, so you don’t have to fear since the probability that it will fit onto your car is high. You can also look up on the Yakima Fit My Car website to be sure your car is compatible with the rack model. The rack installs in a breeze, thanks to its tool-free locking knob that makes this process super fast and efficient. The rack also features SKS locking cable to lock your bikes to the rack. Its anti-sway cradles work perfect, minimizing the contact between your bikes, thereby reducing the possibility of damages or scraping of the bikes finishes. The signature bottle opener from Yakima is a bonus, allowing you to enjoy a cold drink in case you need to hydrate yourself after a long ride. The space ride bike rack can conveniently carry two bikes at a time. And with its super crush zip strips cradles, loading and unloading the bike are simplified, without compromising the premium bike protection it offers. If you do not want to purchase a rack model that has no locking knob to tighten the rack to the spare tire, you need to consider buying this product. The rack comes with good quality locking knob that can tighten your rack firmly to your spare tire. Before you use the rack, be sure to read and follow the following instructions. Ensure the Zip strips are hooked securely over your bike frame. Replace your Zip strips when worn or old. Keep bike tires and straps away from your vehicle’s exhaust to avoid damaging your bike. Make sure the spare tire is secured to your car so it can be supported by the weight of your car. Make sure your spare tire is adequately inflated to avoid damages to your bike and vehicle. Ensure your spare tire, and your rack connects firmly to avert potential damages. Check your spare tire pressure periodically. Do not install this rack on trailers, campers or RVs. Avoid loading tandem or recumbent bikes on the rack. To load the bike, start by removing all the bike attachments from your bikes. Load the heaviest bike first onto your rack. Any improper attachment or misuse of this product can be dangerous. It may result in the damage of your spare ride, bikes, vehicle or the car behind you. Do not open gates with the bike loaded on the rack; it could damage your car. Drive very carefully and a bit slowly when driving on bumpy roads. The rack has a dimension of 43’’ x 14.5’’ x 6’’ with a maximum weight of 5 lbs. This lightness makes it easy to carry, install and store when not in use. 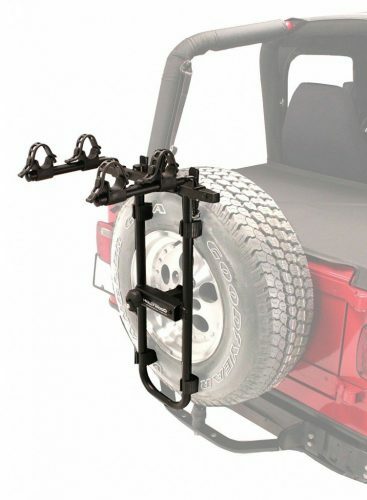 It comes with a heavy-duty mounting plate to attach the rack to any spare tire with ease. The Surco BT300 bike rack can efficiently carry up to three bikes at a time; this makes it one of the best racks to consider when it comes to selecting a bike rack with higher capacity. Are you concerned about your car having scratches,? If yes, it’s high time you forgot your worries. The rack comes with a non-scratch padded channel to hold and lock your bike securely thereby stopping them from getting in contact with the body of your vehicle and with each other. Installing the Surco BT300 rack is easy and can be done in seconds. Here is how to go about it successfully and efficiently. Remove your spare tire from your vehicle. Place the top plate back on the rack, ensuring that the locking knob is towards the rack rear. For rear door and spare tire weight limitation, check the product user’s manual. The Surco BT300 bike rack delivers on its promise of quality; it is one the best bike racks you would not regret buying. Order yours now! If your ultimate goal is to get yourself an excellent quality spare tire bike at an affordable cost, the Saris Freedom Spare Tire Rack might be the best way to go. It has a dimension of 8’’ x 48’’ x 13’’ with a maximum weight of 27.2 lbs. It is made in the USA so you can be sure you are getting nothing short of quality. The Saris Freedom Spare Tire Rack fits into the most bikes, and the good thing about the rack is its fast and easy process of installation. It is designed to look like a tray, and it is not so heavy to carry and mount on your car all by yourself. With the Freedom Spare Tire Rack, you can conveniently carry and transport two bikes (of about 35lbs each) at a time without a hitch. With its Ratcheting straps, your bike safety, stability, and security are ensured even on bumpy roads. Should you have a left, right or centered positioned spare tire, this product is suitable for it all. It also comes with protective rubber holder; this helps to hold your bike firmly without scratching its paints. With this, I can guarantee that the rack will not touch your bike frame nor damage your carbon frame. The rack arm can fold flat, making it easy for you to have compact and convenient storage on the rack or to simply fold it out of your way when it is not in use. Are you afraid that it might not fit into your spare tire? If yes, there is nothing to be afraid of since the rack can be adjusted to fit into all types of spare tires. The product also had good customer review. The buyers of the product were extremely happy with how the rack works. Some of the customers that purchased the product confirmed that you don’t need to take off your bikes to open the tailgate. Another customer testified to the sense of security that the Saris Spare Tire Rack offers compared to using just staps and clips to secure the bike rack to the end of the car. Most of all, the rack is durable, stable, easy to use and install. Just like other Saris product, the Saris Freedom Spare Tire Rack comes with life warranty; this is because Saris’ company is a symbol of companies with high quality and durable products. Highly recommended! The joy you derive from carrying your bikes with you anytime you wish to is sometimes immeasurable and hard to explain, especially when your rack suits your car well and gives you no trouble or hitch in any way. Getting a spare tire bike rack that is durable, compatible, inexpensive, reliable, installs easily and comes with a good warranty is something you as a buyer is probably concerned with before purchasing any rack. In case you need help in choosing a spare tire bike rack that best your vehicle and your bike from the list given above, there are few things you need to consider before purchasing any. The following questions might be able to help you in selecting the best. Why do I have to get a spare tire bike rack for my vehicle? You need to get a bike rack because with it you can easily transport your bikes anytime and anywhere you want to without having to disable your bikes to transport them. Moreover, with a spare bike rack, you don’t have to put your bikes in your car. 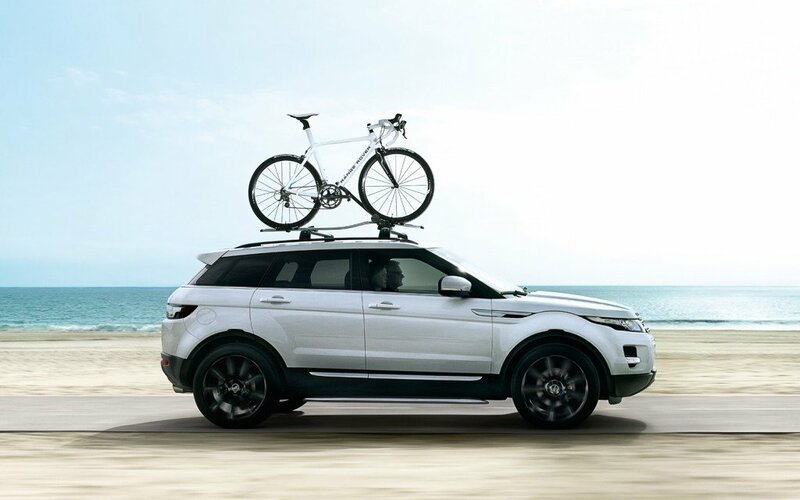 Placing your bikes on your car back provides additional unoccupied space in your car. Getting a spare tire bike rack to transport your bikes saves gas because having a rack provides you with the avenue to travel by a smaller car thereby reducing the gas you need to run the car. 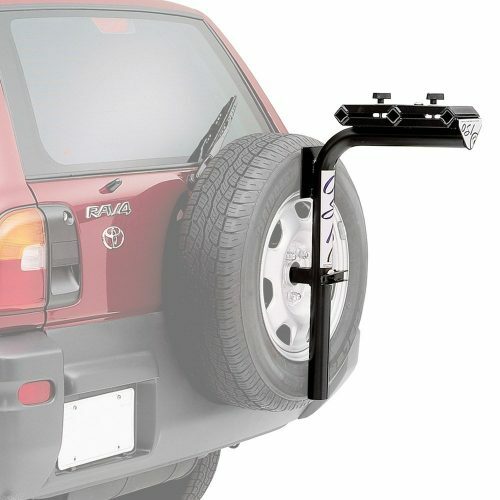 A spare tire bike rack also prevents your bike and vehicle from getting scratches because the rack holds your bike without causing damage to the bike or vehicle. Finally, with a good spare rack bike rack, you don’t need to check if your bike will fall off constantly. What type of spare rack is best for my vehicle? Most spare tire racks have various ways to which you can install them, so you need to pick a spare tire rack whose requirements for installation and compatibility best fit into your vehicle to get the best result. You might have had various options to use from but does your car have a spare tire? If it doesn’t, you don’t need to get one. If your spare tire has a cover, then you need to remove the cover to make the rack easy to install. Considering a rack that will fit perfectly with your car is what you should do before purchasing any rack. Study each spare tire bike rack well and use the one that is best for your car. The number of bikes you want to transport on your rack is also a determining factor on what type of rack to buy. If you intend to transport up to two or three bikes, you need a rack that will transport two or three bikes with ease. What type of rack will best suit my bike? The type of bike you own will determine the type of rack you should buy. Buy a rack that will suit your bike capacity. Most spare tire bike racks will indicate the capacity of bikes it can carry, and it is advisable you get the rack that best suit your bikes to avoid damages to your bike and your vehicle. How well can you handle the rack? You need to get a spare tire rack that you can handle by yourself and a bike you can install easily. Most spare tire bike comes with instructions and guidelines on how to install the rack, get a rack you can install easily without unwanted or unplanned problems. Fortunately, you can pick from any of the spare tire racks that are reviewed above can all be installed in seconds. How long can the rack last? You need to purchase a durable rack that will last as long as it can since you do not want a situation where the rack you purchased wares off in no time. Finding out how long the race would last is research you need to carry out before purchasing any rack. How much do you plan to buy the rack? Before buying a rack, you should ponder on how much you wish to buy the rack. You should also consider if the amount you are willing to pay for a rack can get you the type of rack that best suit your vehicle. Remember that you do not have to hemorrhage your bank account to get yourself the best spare tire rack. 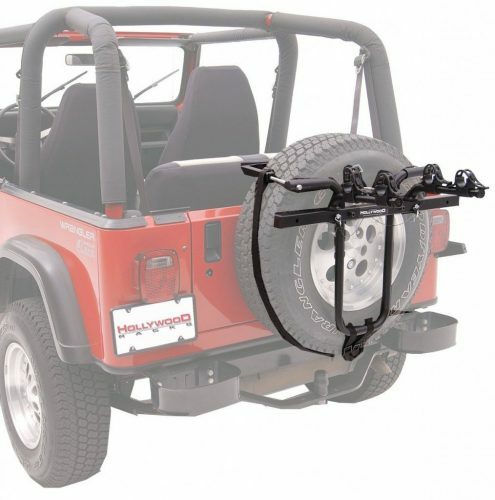 There are midrange spare tire racks that can provide you all you need in a rack. It is, therefore, better not to conclude until you have come to terms with these considerations. In the end, make sure you purchase a rack that suits your need but falls within your budget. Where do you want to use the spare tire bike rack? Where you want to use the spare tire bike rack is also an important factor to consider when selecting the best bike rack. Not all spare tire bike racks can be used off roads, dirt road or avenue, and rough roads, therefore considering where you intend to use the rack will be of a great advantage. If you are someone that does not pass by the regular roads, you need a rack that can withstand the hazards on the road you toil to ensure the durability of your rack and prevent damage to your bike. As far as transporting your bike, the spare tire bike rack is one of the easiest options to install. You’ll find that most of these racks allow for centered and off-center mounting and should fit a wide range of tires. This means that even if your vehicle uses over-sized truck tires, your bike rack should still fit. Professional spare tire bike racks will come with a tool-free locking knob so you can attach the rack to your vehicle without any fuss or hunt around for the right tools. Don’t worry if you do your biking with a partner as many of the racks can carry two bikes or even three. If you do opt for a two bike rack, make sure that it is equipped with some anti-sway cradle to eliminate bike-to-bike contact. This is especially important when going off-road as things inevitably get a bit bumpy. Of course, you are not going to be driving around with bikes on the back of your vehicle at all times, so most spare tire bike racks fold down when not in use. If you do take your bike with you wherever you drive you’ll want to opt for a rack that has locking cables to lock the bike to the rack just in case someone with sticky fingers takes an unhealthy interest in your property. If you think that these are a lot of features for a simple rack, you might be surprised to learn that some come with integrated bottle openers! You never know when you might find yourself thirsty after a ride and need to hydrate while fastening your bike to the rack. As great as a spare tire bike rack is there are a couple of downsides too. Like I mentioned previously, you need a spare tire that is mounted to the rear door of your vehicle to use the rack in the first place. Should you ever have the misfortune of ending up with a flat tire while transporting your bikes, you have to take everything down to change the tire, which is a bit of a hassle. Mounting two or more bikes to the back of a vehicle with a spare tire does place a bit more stress on the hinges. Depending on the type of vehicle you drive this may or may not be a problem, but I would suggest doing some research and finding out from others what their experiences are. I would suggest inspecting the hinges regularly for signs of wear and tear so that you don’t end up with everything breaking off in the middle of traffic. Taking the time to do the inspections is much better in the long run than losing a rack, a few bikes and a spare tire on the freeway, let alone causing an accident for whoever is unfortunate enough to be driving behind you should this happen! Since the bikes are mounted to the spare tire on the rear door, it can also be tricky to open and close this door depending on the type of rack and amount of bikes you have on it. This is more of a minor inconvenience than a real issue, but it is still worth mentioning. Oh, and those tool-free locking knobs I mentioned that are so convenient… Unfortunately, they are also very convenient for the criminally inclined so if you live in an area with a crime problem it is better not to leave your bike rack in the car when not in use. Most spare tire bike racks are a breeze to install but follow the instructions properly. You’ll find that there are usually different tongues for different sized tires, so if you get this wrong, the rack won’t be as secure. This is not only dangerous for your equipment but will also cause rattling while you drive your vehicle which is obviously undesirable. Incorrect installation can cause damage to the spare tire which is also something you want to avoid. You’ll find plenty of cheap spare tire bike racks on the market, but if you care about your bikes, it is better to invest in something that is sturdy. It might be a steeper initial investment, but in the long run, it is still cheaper than having to rebuy a new rack or ending up with damage to your bike. Of course, if all you do is transport your bike to the park every other weekend, you probably don’t need a top of the line bike rack to get the job done. Anyone that is serious about cycling and regularly drive out to the country for some off-road biking will benefit from the more durable offerings. If you have the type of vehicle that can handle a spare tire bike rack, it makes for a nice alternative to something more elaborate like a roof rack. It is also easier to attach and detach than a roof rack plus it frees up the roof for whatever else you need to take along on your cycling trips. If you are serious about your cycling, a spare tire bike rack is a good investment that will see a lot of use so purchase wisely. There are much more spare tire racks that can help you transport your bikes with ease. However, the products reviewed above are the ones we found more secure and reliable. Are you looking for an inexpensive spare tire bike rack to transport your bikes with ease? Do you wish to enjoy the benefits of using a rack that will transport your bikes without causing damage to the rack, your bike or your vehicle? Why not get yourself any of these products now. With this valuable equipment that offers you real value for your money, you would be doing yourself a great favor. These spare tire bike racks are simply a vehicle accessory you will be happy you purchase. Don’t wait till you have no reliable means to transport your bikes, get a good spare tire bike rack today and feel free to come back with your testimonies.